We’d love your help. Let us know what’s wrong with this preview of Flirting with Disaster by Jane Graves. HE WAS THE MAN SHE COULDN'T HAVE . . .
On a humanitarian mission to fly doctors to a remote village in Mexico, pilot Lisa Merrick discovers something sinister lurking behind the organization in charge. Her plane is sabotaged, leaving her trapped in the Mexican wilderness with a price on her head and no way out. Injured and desperate, she manages to contact the one man she k HE WAS THE MAN SHE COULDN'T HAVE . . .
Dave DeMarco is stunned when a woman from his past phones him late one night with an incredible story of smuggling, sabotage, and attempted murder. Just hearing Lisa Merrick’s voice brings back memories Dave doesn’t want to face, but a promise he once made leaves him no choice but to help her. Soon, though, his mission to rescue Lisa becomes a struggle for survival against an enemy who wants them both dead. When the danger they face clashes with the passion that still burns between them, Dave vows to protect the woman he never stopped loving–and keep her in his life forever. . . .
To ask other readers questions about Flirting with Disaster, please sign up. My thanks to the author, publisher and NetGalley for an ARC of this novel in exchange for an honest review. Lisa and Dave knew each other in high school. She was a "bad girl" from the wrong side of the tracks with an equally bad reputation. Dave was a decent guy, engaged to marry Carla right after high school. There was definitely "chemistry" and "feelings" between "good boy" Dave and "bad girl" Lisa. But despite these My thanks to the author, publisher and NetGalley for an ARC of this novel in exchange for an honest review. Lisa and Dave knew each other in high school. She was a "bad girl" from the wrong side of the tracks with an equally bad reputation. Dave was a decent guy, engaged to marry Carla right after high school. There was definitely "chemistry" and "feelings" between "good boy" Dave and "bad girl" Lisa. But despite these "feelings", Lisa is crushed when Dave married Carla, as planned, and they eventually had a daughter together. Lisa leaves town, becomes a pilot, and lives life on her own terms, always making sure she is in control of all her relationships (such as they are) from that point on. When one of her clients tries to have her killed, Lisa contacts the only person she can trust: Dave, who is now a cop - and widowed to boot. There are a few parallel side stories that the author throws in. I found it a bit distracting, but you kind of get two romances for the price of one. The author has decent writing skills and she writes very steamy bedroom scenes, so if this is what you look for in a story, you will find it here. ‘Flirting with Disaster’ is my first Jane Graves book—an author that somehow slipped under my radar—and from what it looks like, a second edition reprint of a previously-published book of the early 2000s. This does feel like reading an older style of romantic suspense so to speak: where action and passion collide, both burning hot and fast, the protagonists (linked only by a tenuous thread in their high school years very long ago) suddenly diving into each other like the end of the world is comi ‘Flirting with Disaster’ is my first Jane Graves book—an author that somehow slipped under my radar—and from what it looks like, a second edition reprint of a previously-published book of the early 2000s. This does feel like reading an older style of romantic suspense so to speak: where action and passion collide, both burning hot and fast, the protagonists (linked only by a tenuous thread in their high school years very long ago) suddenly diving into each other like the end of the world is coming when danger flares. Somehow I think of Keanu Reeves and Sandra Bullock in ‘Speed’, or some other movie in that sort of similar make, where the connection is fast but cursory and I can’t think of anything else past that moment of seizing the day. Like a movies with scenes told through multiple POVs at breakneck pace, both Dave and Lisa felt like they were carved out of stereotypes at times. The white-knight with a messiah complex, going by way of the cop family tradition and the latter, a wildcard, impulsive and petulant pilot who runs off the deep end just because she can, self-absorbed in putting her own needs and ambitions first (with several TSTL moments), and as a result turns out to be pretty much the female equivalent of the manwhore. The secondary romance between Sera/Adam was oddly, the one that drew me in more. I liked their dynamic better, perhaps more so because it also revolved around a dead spouse without the misplaced affections. 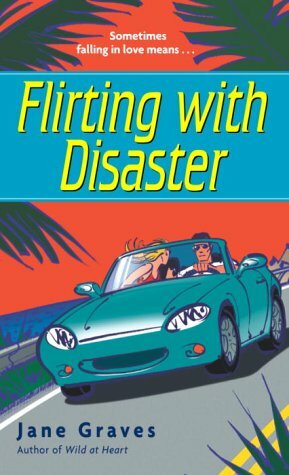 In any case, ‘Flirting with Disaster’ was a quick read, but a middling one at best. Graves does write well undoubtedly, but it was just the pairing that didn't do much for me. FLIRTING WITH DISASTER is a fast-paced romance that I was definitely torn about. While there was much that I enjoyed about Dave and Lisa’s story, it simply didn’t stack up with the previous stories I’d read in this series. I don’t really know why it just happens with some heroes and heroines – but, that doesn’t mean that it’s a bad book, nope that’s not true, simply that I enjoyed the first two stories more. Lisa and Dave had a connection back in high school. Yet, Lisa did not get her man then as he went on to marry another. She graduated and put her work first and a love life a far second. Right now she’s in Mexico having just discovered that all is not above board with the group that she’s working for – in fact, something downright illegal seems to be going on. Her plane has been put out of commission, she’s hiding from people who want her dead and she decides that now it the time to call in an old, long overdue favor from her past. Despite his decision to marry another woman, Dave has never forgotten Lisa or that promise of help. Years have passed, Dave is now a widower and a police officer. When she unexpectedly calls him asking for help he doesn’t hesitate. Now he’s in just as deep as Lisa is as they fight their way back home, evade getting themselves killed, get the bad guys captured and try to figure out their future. There are steamy moments, some twists and turns along the way and a delightful secondary romance going on for another couple. If you love a good Romantic Suspense then I’d suggest you give FLIRTING WITH DISASTER a try. *Note: Be aware that this is a reissue of a previously published novel from 2003. You might have it on your shelf with a different cover. ‘Ve been absolutely loving the De Marco Family series and book three, Flirting With Disaster was just as good as the first two. Dave De Marco is the star of this book. A respected police officer and all round good guy, Dave is hiding a secret - he’s loved Lisa Merrick for the past eleven years despite having married his longtime girlfriend Carla just weeks after first making that discovery. Lisa has had to be tough and focused to achieve her goal of becoming a pilot. She’s had the worst sort of ‘Ve been absolutely loving the De Marco Family series and book three, Flirting With Disaster was just as good as the first two. Dave De Marco is the star of this book. A respected police officer and all round good guy, Dave is hiding a secret - he’s loved Lisa Merrick for the past eleven years despite having married his longtime girlfriend Carla just weeks after first making that discovery. Lisa has had to be tough and focused to achieve her goal of becoming a pilot. She’s had the worst sort of childhood and has succeeded in her career despite that, but as this story opens Lisa finds herself in a heap of trouble with Dave about her only chance of getting out of it. Flirting with Disaster by Jane Graves. This is the third book in The DeMarco Family series. A romantic suspense . I like the character development and the plot in this book. I've enjoyed each of the previous books in this series and look forward to reading the next book. So bleh I struggled through it. Didn't even feel like reading it when I was stuck in a bus with nothing else to do so decided it was time to put it down. Stopped at 57%. Lisa Merrick knew that she could depend on her old high school friend to come to her rescue and he did, even if she was in Mexico hiding from someone who wanted her dead. Dave DeMarco had told her many years ago that if she needed him for anything, all she had to do was call, and she did. Holding to his promise, he flew to Mexico to try and get her out. Lisa has stumbled upon a illegal operation and was on her way to tell the Border Guards when he plane went down. Someone wanted her dead and they Lisa Merrick knew that she could depend on her old high school friend to come to her rescue and he did, even if she was in Mexico hiding from someone who wanted her dead. Dave DeMarco had told her many years ago that if she needed him for anything, all she had to do was call, and she did. Holding to his promise, he flew to Mexico to try and get her out. Lisa has stumbled upon a illegal operation and was on her way to tell the Border Guards when he plane went down. Someone wanted her dead and they tried many ways to accomplish that. Exciting action packed story full of intrigue that had me total engaged throughout and it did have steamy parts with even a secondary romance. Main characters were alphas but held their past insecurities a bit too long. Smugglers are trying to kill pilot Lisa so she calls in an old promise of help from cop Dave. A good summer read. Easy to get in to - romance and action. Fast paced. Seems like it might actually connect to other books by this author (characters are referred to, not sure if this is actually what that means or not). Fast and fun read for a summer day! He married the dependent girly-girl (who is now dead). She stayed independent - until busting the drug deal went wrong and people are out to kill her. She falls back on his promise to her that he'd help her out if she ever needed anything. Lots of flights between Mexico and US. Very pedestrian mystery and not that well written. Predictable. I got about half way through and lost interest. Not a bad book but not one of my top reads. Another good book from Jane Graves. This is the 3rd in the DeMarco brothers' series. Dave and Lisa. I liked the book, but I think the other two were better than this one. Jane lives in the Dallas area with her husband and a beautiful but Jane Graves is the New York Times and USA Today bestselling author of twenty contemporary romance novels. She is a nine-time finalist for Romance Writers of America's Rita Award, the industry's highest honor, and is the recipient of two National Readers' Choice Awards, the Booksellers' Best Award, and the Golden Quill, among others.